When the sun goes down, the Alamo City heats up. 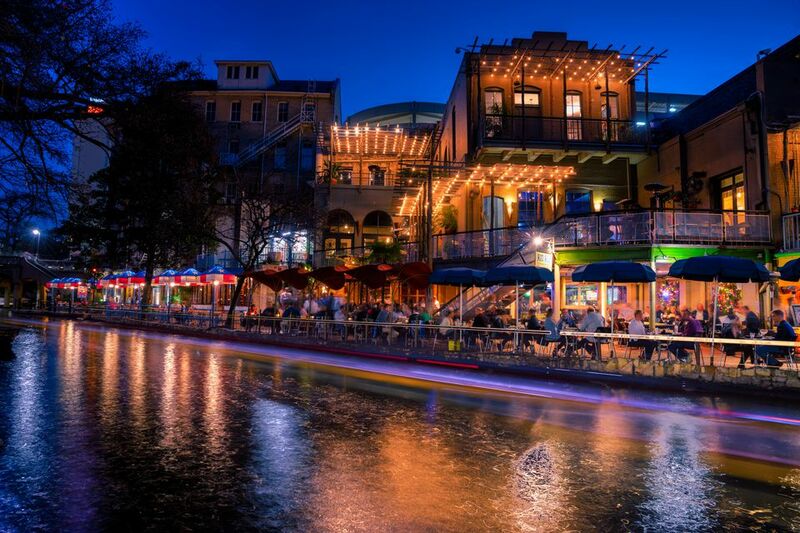 There are dozens of upscale bars, all-hours restaurants , and nightclubs in San Antonio with a full range of prices and amenities. When you want to dress up and have a big night out, here's where you'll want to go. Start out with the green eggs and ham nachos at the happy hour and wind up with the fried apple pie and "Hey, Baby, Qué Pasa?" cocktail, and you'll know why this place has been a local institution since the end of Prohibition. The decor is dark art deco. The booths are tall and comfy. And the view of the Riverwalk is unequaled in all of San Antonio. We're not talking about something from the periodic table! At Zinc, delicious appetizers are expertly paired with the wine and champagne available at the bar. You can enjoy your small bites and cocktails in the indoor lounge or outside near the fountain in Charles Court. The kitchen closes at midnight. The bar is open for another two hours. If you can't go to Cuba, Cuba will come to you, thanks to this paradisial cigar and jazz bar complete with comfy leather sofas, strong martinis, and delicious tapas that would do even Che Guevara proud. Open Sunday through Thursday until midnight, and 2 a.m. on Friday and Saturday. As if crystal chandeliers, 14-foot ceilings and a 20-foot bar featuring craft beer and specialty martinis weren't enough, there's also live music, guest DJs, and local artists to keep your fingers snapping and your foot tapping until 2 every morning. The pristine decor serves as a perfect backdrop to DJs, dancing, and special light effects spectaculars, and proves that sometimes the best way to "color" your night is through white. Open Sunday and Monday until midnight; all other days until 2 a.m. The vaulted ceiling, exposed pipes, and skyline views make Paramour a favorite hot spot. In addition to a lavish list of specialty drinks, this destination boasts San Antonio's first rooftop bar. Open every day until 2 a.m., except Sunday and Monday, when it closes at midnight.